The Ben Collins Credit Card Tracker is meant to give you insights into your credit card spending. 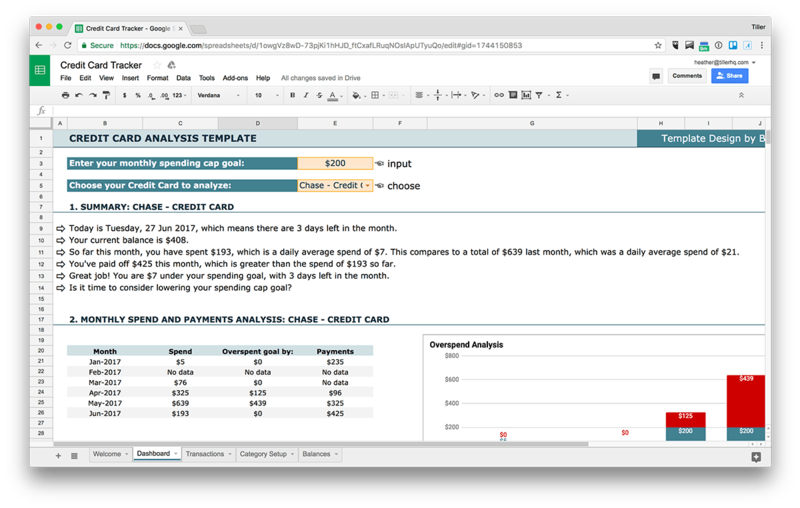 If you often spend money on your credit cards, rather than your debit cards and want detailed insights about your spending with the option to track your spending against a spending cap goal then this is the template for you. 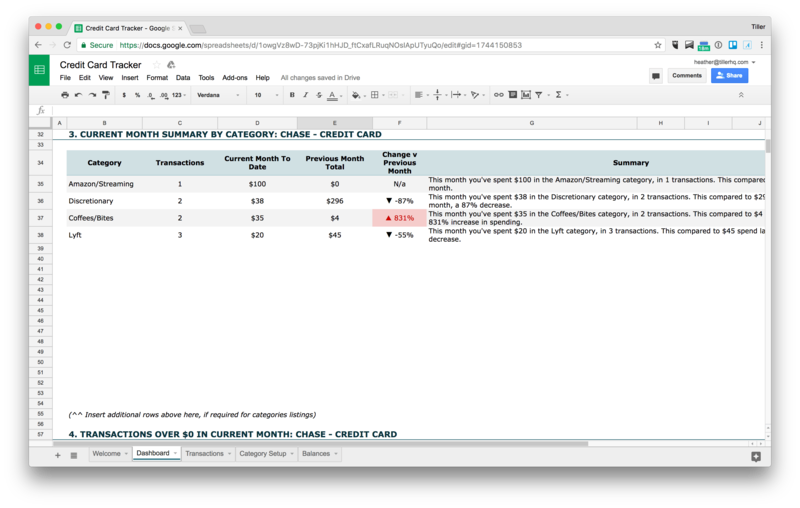 Link your credit cards to this template from the Tiller Console. Set up your categories on the Category Setup sheet. Categorize your transactions. We recommend starting out with this month first rather than worrying about months of historical data. Set your spending cap goal on the Dashboard. Choose one or all of your credit cards to analyze. 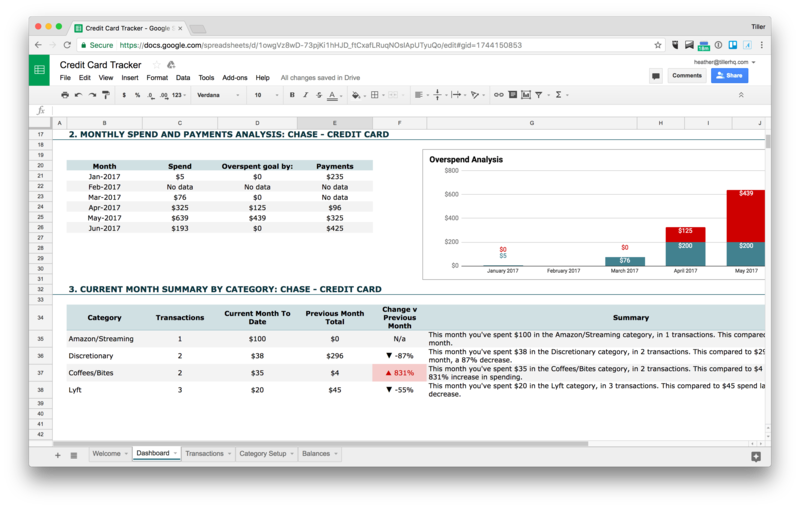 Review the dashboard to gain insights into your spending. Today’s date with days remaining this month. Total spend so far this month with a daily average calculation and a previous month comparison. Progress made toward paying off your balance. Your current amount over or under your current spending goal for the month. How much spending exceeded the goal cap each month. How much money paid toward the credit card account each month. Visual display of the above yearly spending analysis (chart to the right). A brief summary and bar chart showing the relative spend in that category. Get an analysis of credit card spending that exceeds a set threshold broken down by categories. Be sure to choose your spending threshold and select all or one of your categories to get a detailed breakdown of your spending. 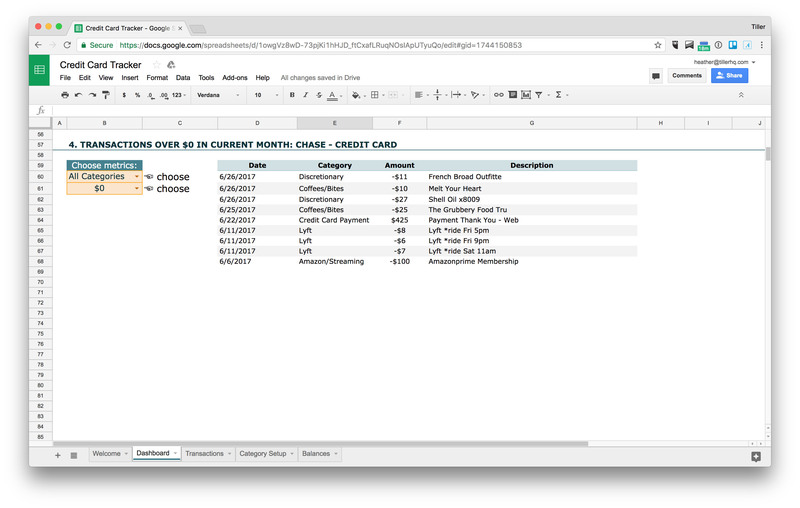 Take a look at these quick resources for some basics about Tiller finance spreadsheets.